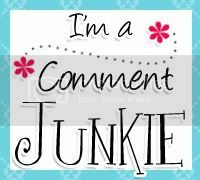 Lady of Perpetual Chaos: The Secret To My Success-Part ? Parenting tip for the day. 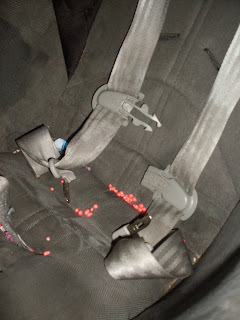 Do not get Nerds for your kids to have in the car, no matter how desperate you may be in that moment of purchase. No matter how well you think you've cleaned it up, months later when your husband is vacuuming out the van he will be curious about the millions of pink Nerds that were in every nook and cranny. Got any good tips for me?! This reminds me of when we got married. Adam's family loves practical jokes. I like them, but I have a line. They put rice in his suitcases and in his car, everywhere. In the vents, the seats, everywhere. We still had rice coming out of the vents, two years later. Not cool. yeah nerds get everywhere. Nerds ropes are good though. SO-I've never heard of nerd ropes...we must try them some day. 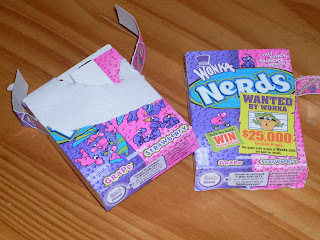 I love Nerds, especially the pink ones! At least it wasn't chocolate or caramel right? I am interested in this business about nerd ropes. Is is possible that there is a type of candy in the world that I haven't tried? Food in the car is never good when kids are involved. I find stuff everywhere, but have accepted my messy reality. Hey, I made that mistake once. Yeah, we still find nerds in the seats every time we clean the car - which, okay, isn't terribly often. Forgotten crayons melt in the car when it gets hot. Even if it was winter when they got forgotten in the seat.